For this award-winning design, the client desired a lush tropical backyard oasis and an area to relax and entertain. The design maximized the creative opportunities and allowed the existing canvas, which consisted of a little more than some mature vegetation and island architecture blend of the home, to dictate a natural feel by blending the natural and man-made environments seamlessly. Special attention was given to preserving all the native specimen vegetation on the site. 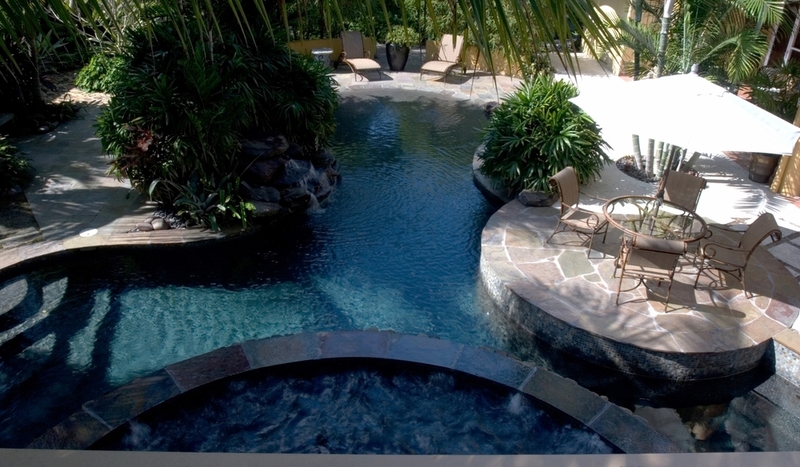 The lagoon-style pool was designed with a beach entry that provides a soft, lagoon-like, natural environment, incorporating details to create the desired effect of resort living.